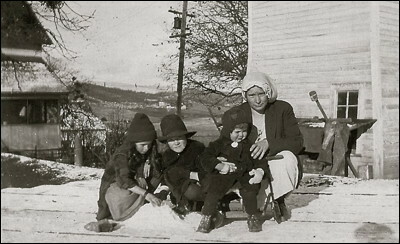 Winter day at Edgevale (near Phoenix, OR), 1922. My Grandma Maude with her three daughters (left to right): Leona, Carol and Fredene (my Mom). During Prohibition my grandparents managed the farm and orchard at Edgevale during which time the main house thrived as a popular Rogue Valley speakeasy. By the 1930s they had built their own farmhouse on Kings Highway outside of Medford. In the new house, one section of the bookcase in the living room rolled aside to reveal a ventilated secret room under the stairs where Grandpa Fred kept his whiskey still. All of the buildings at Edgevale, including nearby Independence School, are still standing. The farm is now home to a winery and vineyard.